In this study of a Garden Spider’s web in the evening sun, I love the way the web refracts the sunlight. Look at that little cone of colors, to the right of the spider, it is a soft focused part of the web, but the way the light is caught on the tiny droplets of the web. The tiny drops are the sticky trap part of the web. This image is beautiful in its small version, but at twenty inches by thirty inches, it is an eye catching jewel. 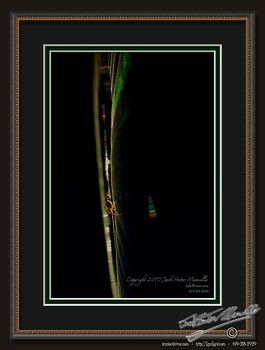 This entry was posted in Animal, Fauna, Nature, Pets - Crawlers, Purchasable - As Art Prints. Bookmark the permalink.